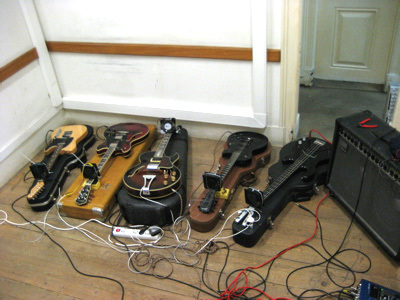 This installation was presented in a series of events organized by the Filho Único Association in Lisbon, this series of events are realized in a huge apartment from the end of the 19th century, this apartment have more than 20 rooms connected by one big corridor, the organizers idea is to have several concerts happening in the same night, sometimes more than 20 concerts in the same night, each of them in one of the several rooms, where some concerts happen at the same time, this events have been overcrowded, sometimes more than 400 people pass by and they mostly hang out and chat without any consideration for the concerts that are happening, ending up depreciating the concerts in favor of the event idea. having been invited to participate we knew we didn't want to do a concert because the caotic aspect of the event ends up not being propicious for the kind of music we usually make, the acoustic qualities, the necessary silence and atention wouldn't be possible in such an environment. 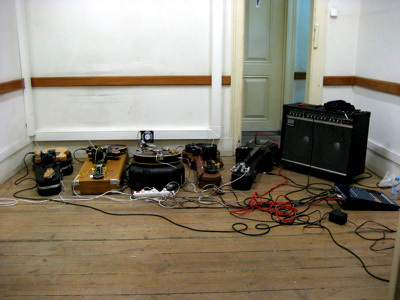 In a reaction to that we wanted to create an installation that could work by itself, that could play without the need for the performers but at the same time could be influentiated by the spectators presence. 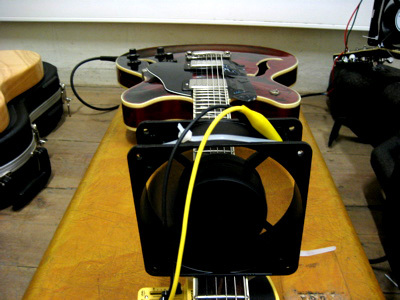 It was a coincidence that both Pedro and myself were already making use of fans for different purposes, Pedro was allready running some tests with fans to excite guitar strings to vibrate, we took these explorations further trying with different fans and with different ways to position them in order to get the best sonic result. 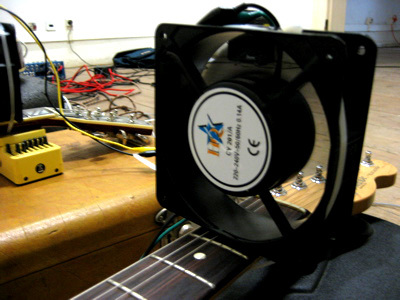 We ended up choosing to use 220v 12cm axial fans attached to the first fret of the guitars arms and the wind blowing in the guitars body's direction, we tuned all the guitars in specific frequencies that are related to the specific rotation frequency of each fan making use of the sympathetic resonance phenomenon in order to get the loudest string vibration possible captured by the pickups. 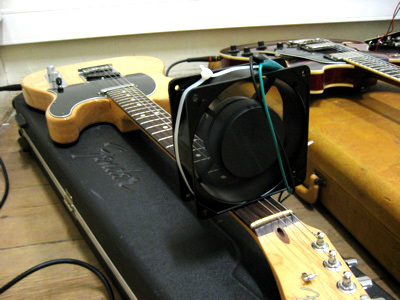 Although this process rendered audible the guitar's sound it was captured by the pickups on a very low volume, we were then using a mixer to plug all the guitars in and then connecting the mixer's output to a guitar amplifier, this way we could bring each guitar's volume as higher as we could and then bringing each one very close to the feedback threshold. 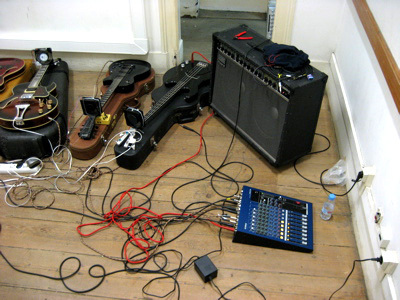 The soundscape created being somehow instable in feedback terms could be affected by the movement of the spectators in the room bringing the feedback closer to being heard. Another factor of the experimentation we want to develop for the next step would be to work with compressors in order to supress and avoid unwanted extreme feedback levels. Because the installation was only presented for 30-45 minutes everything was presented in a very experimental way not concerning too much about the sculptural aspect of the piece. For this residence we would like to take our explorations further and spend more time both in the aesthetical presentation and in the sound quality of the piece. Also in my own artistic practice and my continuous use of fans i got to know and use stronger fans which we would need some time to test but most probably would work better for the installation purpose.